Why do these languages exist? Do I need know PL/SQL? What if you need to perform more complex loops or conditions in your code than the SQL programming language allows? 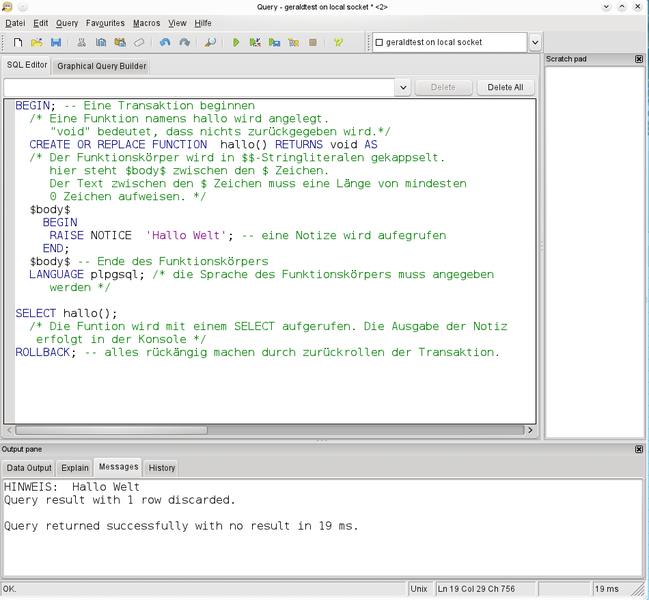 That’s why most major brands of database also understand commands written in a “procedural” programming language. Oracle calls theirs “PL/SQL,” Microsoft SQL Server calls theirs “T-SQL,” PostgreSQL calls theirs “PL/pgSQL,” etc. Let’s explore whether you need to learn one of these languages. SQL is meant to be simple and accessible to non-programmers. It’s meant to be relatively foolproof. In other words, as rich and complicated and powerful as it is, in the grand scheme of programming, there’s a lot it can’t do. When you want to write complex conditional logic or specialized loops over the rows in a data set, you may exceed SQL’s limits. Languages like PL/SQL allow you to do this. In most databases, they’re also what database “triggers” are written in. It depends what you’re going to do. But for the most part, you may not be allowed to help your company write “triggers”, “functions”, or “stored procedures”. You may be limited to writing “anonymous blocks”. Let’s take a look at each of these. Triggers are code, saved within the database, that the database has been told to execute every single time someone attempts to insert, update, or delete a record meeting certain criteria (e.g. stored in a certain table). Functions are code, saved within the database, that become extensions to the SQL language (for users with permission to execute the functions). Storing “functions” within the database lets you add your own CleverName(...) operations for end users to use in their SQL scripts. Who is enrolled this semester? Let’s say one of a company’s web developers is writing a self-service portal for customers that retrieves data from your database and displays it on the screen to those customers. There will be at least one SQL query to your database, because at the very least, you have to tell the database whose data the web site needs to display. Where did test@example.com come from? From some stranger on the internet claiming that that’s their email address? What if they lie and put more SQL code – code that deletes all tables in your database – into the “what’s your email address?” box? From a database administrator’s perspective, it’s considered best practice to prevent the username under which “public”-facing code like the customer self-service portal runs from directly executing any SQL queries against the database. It’s then those procedures, saved inside the database, that are responsible for making sure that email_address_here is a real email address, and safely refusing to fulfill the request if not. If you aspire to become one of the people who writes “triggers,” “functions,” or “stored procedures” for your company, you must learn a “procedural” database programming language like Oracle PL/SQL, Microsoft SQL Server T-SQL, or PostgreSQL PL/pgSQL. They’re all somewhat similar, so feel free to choose whichever one makes the most sense to you. As an end user, I can usually do everything I need to with SQL. But once or twice, I have found myself needing to do things that were a little bit “fancier” where a “PL/SQL anonymous block” provided me an extra boost in computing power. My advice: pick the approach that works best for your business needs (including security). Beginning PL/SQL: From Novice to Professional by Donald J. Bales. If you already know some PL/SQL but want to make sure you understand best practices, it’s written well enough that you don’t need to stop and do the exercises. If you are a total beginner, it has great programming exercises. Oracle certification prep study guide for 1Z0-144: Oracle Database 11g: program with PL/SQL by Matthew Morris. It’s about an out-of-date version of Oracle, but the fundamentals haven’t changed enough to avoid reading a well-written book. Database PL/SQL Language Reference by Oracle. This is a reference manual, not a newbie’s tutorial. It’s worth knowing about if you’re an advanced programmer who gets stuck on a fine point. Sorry I’m not familar with any great beginner’s tutorials for T-SQL or other competitors to PL/SQL. Let me know if you have any!